A NY attorney creates a visual presentation that makes it easy to see how Israel is crucial to world security, reveals the water theft lie. Mark Langfan, a successful New York attorney and staunch supporter of Israel, came to the conclusion one day that the truth about Israel must become accessible and easily understood. Not one for letting things stop at the idea stage, the talented attorney created an original and easy to grasp visual method that can - in minutes - explain the problems Israel faces when it talks of "defensible borders", expose the truth about the Palestinian Authority water resources canard and prove the way Israel's safety affects the world. He then invested time and money and created a one-of-its-kind 3-dimensional topographic raised-relief map system of Israel, accompanied by special plastic devices that make his subject matter clear as crystal. He has published fliers, kits, map sets and booklets explaining his methods and how to use the graphics in the kits to best advantage. Over the past 20 years, Mr. Langfan has briefed many congressional and Senate offices, the US Joint Chiefs of Staff Israel Desk, and even The New York Times Editorial Board using his topographic map of Israel. The enthusiastic Langfan is currently visiting Israel, where he has briefed Ambassadors, MKs, Government officials and Spokespeople, using his unique maps and vast store of knowledge to show how the problems can be easily comprehended, especially highlighting the strategic threats of seceding from the West Bank. Last week Langfan was invited to give a special briefing in the Knesset, by MK Yaakov Katz (National Union), attended by key party activists, public figures and leaders of Judea and Samaria including Dani Dayan, Chairman of the Yesha Council and the Ambassador of Costa Rica, H.E Mr. Rodrigo Carreras. Arutz Sheva was there. Langfan uses his map to level the playing field in a sea of political jargon and slogans. Much of his presentation focuses on the issue of water, which is key to understanding the conflict, as he explained. “People don’t realize that close to half of the water in Israel comes from underground aquifers in Judea and Samaria. Many of the key "settlements" like Ariel and Kedumim were built along the line from which water runs down westward towards the coast in order to protect this vital source. Israel gives Palestinian Arabs much more water than demanded by the peace agreements . 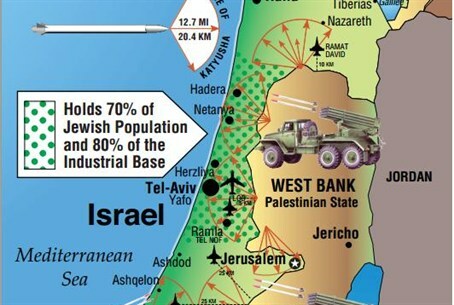 Langfan’s Israel map system provides decision- makers with a scientifically exact topographic chess board on which to understand and game out various options for peace and to better understand the “code” in which Middle Eastern leaders actually talk. Terms such as “Settlement blocs,” “Jordan Valley,” “contiguity” and the “Mountains of the Golan Heights” become crystal clear and easily understandable. Arutz Sheva has published several articles about his method, including his explanation of the water issue (click here for a pictoral representation with links to the creator's website), but the kits are necessary in order to fully explain - in 3D - the vital points he raises. Langfan's system has proved an extremely beneficial tool in explaining the vital threats to Israel's security in clear visual terms. When it comes to defending Israel, Langfan has proven that pictures really do speak a thousand words. For Mark Langfan website, click here.